The Kempsell SAGS sold today for a hammer price of £8,000. James Hind served with the 1st Battalion, 24th Regiment of Foot in South Africa during the Zulu War, and was killed in action at Isandhlwana on 22 January 1879. 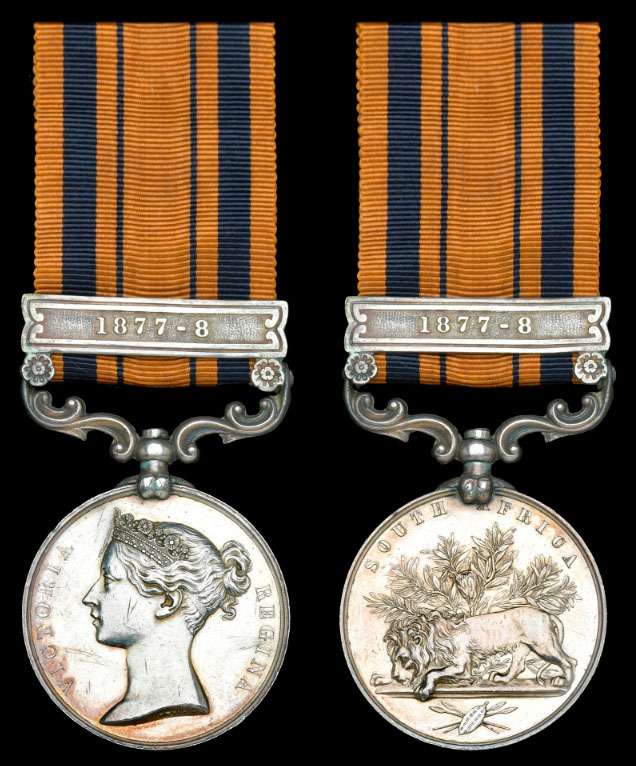 Captain Erskine is also shown on the roll of the 2/3rd Natal Native Contingent for the medal with clasp ‘1879’ which implies the possibility of a second medal having been issued. Charles Alexander Erskine was born at Grahamstown in about 1846, the son of Alexander Erskine and Mary-Ann. 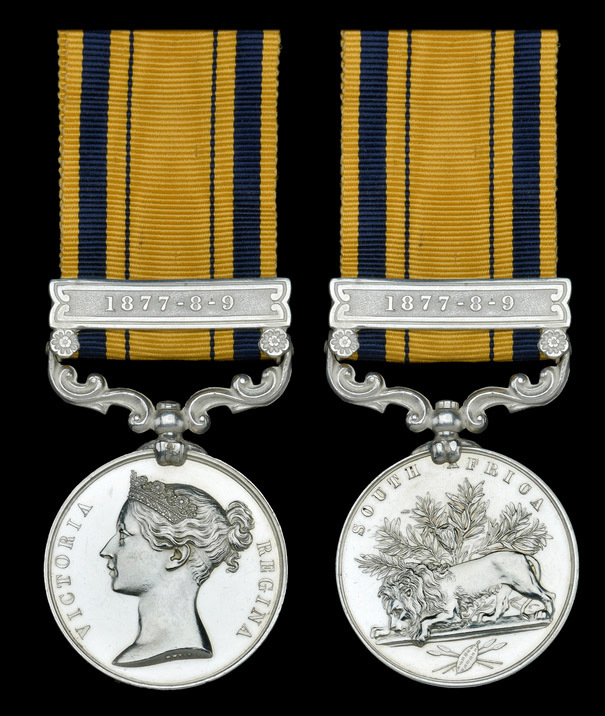 He served as a Lieutenant in the Queenstown Volunteer Contingent against the Gaikas, Galekas and other Kaffir tribes during 1877-78 (Medal). In late 1878 he joined the 2nd Battalion, 3rd Regiment, Natal Native Contingent, and was killed in action at Isandhlwana on 22 January 1879. Just a few lines to let you know how I am getting on. We arrived here about 15 days ago and encamped to get our men together we have now got almost all now and as soon as the others come we move to where the soldiers are waiting for us about 20 miles from here. We are getting on fine as yet with the men. They are picking up the drill better than I expected as they are taught just the same as the soldiers. As soon as we join the soldiers we are to move into Zulu country in three divisions each division being 5000 strong with two Batteries of Artillery & 2 Batteries Rocket Guns to each division so I think we ought to do a little execution with 15000 men altogether. Old Cetywayo can bring out about 70000 trained men against us. This place is called Sand Spruit and it is a Sand Spruit for as soon as the rain is over the water all soaks away but by digging about 3 feet in the sand we get any quantity of water. This country is the worst place ever I saw for rain every afternoon we have a thunderstorm. We had Regimental sports the day after Xmas they passed off very well. As yet our Camp is in a healthy state and I hope it keeps so. This sort of life seems to agree with me, and another thing it and don’t care how long it keeps on especially as the pay is good. We have lost a few more horses since I last wrote of sickness. I hope you received my last in case you did not I will let you know again that I have lodged in the Standard Bank Pieter Maritzburg a little money and will also place all I can there so that if anything happens to me you must see and get it for your use. I would like you to keep these two letters in case of accidents.